E2 The sacrifice of Isaac. Old Testament. S2. David slays the lion. Type 1 David on lion's back. Old Testament. 1 Samuel 17.34. 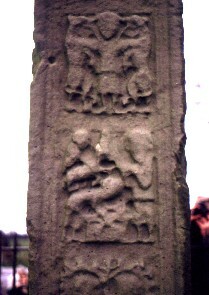 Allen, J. R., , ‘On some points of resemblance between the art of the early sculptured stones of Scotland and of Ireland’. In Proceedings of the Society of Antiquaries of Scotland 31 (1896/97) 309-332. Henry, F., La Sculpture Irlandaise pendant les douze premiers siecles de l'ère chrétienne 1, , Paris (1933) .